By sponsoring glasnost and democratization, the reformist leadership dealt a deathblow to the power monopoly of the Communist Party and thereby destroyed unwittingly its own institutional base. The party sustained a critical loss of authority and faced massive popular hostility, as it was held responsible for all the mistakes and crimes of the Communist period. The flood of publications on the repressions under Stalin and the human rights abuses under Brezhnev caused irreparable damage to the image of socialism, impelling the population to vote against the old corrupt elite. The mass media now portrayed Marxism-Leninism as an ideology that had led the country into a historical dead end. Instead of reinvigorating socialism, democratization eroded the ideological foundations of the Soviet state and delegitimated the party’s privileged position as the core of the political system. The reformist leadership’s plan to revitalize the soviets also backfired. 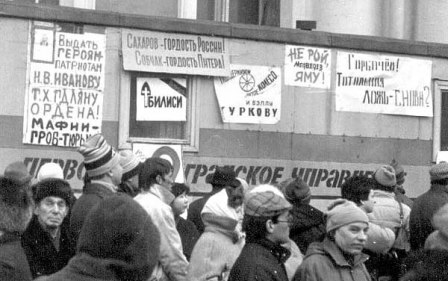 The expectation was that popular elections to soviets would provide a new source of legitimacy for the system and that, at the same time, the party would somehow retain its control of the elected governing bodies. These hopes proved unfounded, however, and following the 1990 republican and local elections, real power began to shift from the discredited center to the republics. Moreover, the new-style soviets proved ineffective as governing structures. They were revived under the old Bolshevik slogan of “All power to the Soviets!” designed to make them more independent from the party structures. In practice, this led to the soviets’ attempts to grab both legislative and executive powers. The new system failed to act as an effective legislative branch and completely disorganized the executive. Gorbachev tried to correct the situation and prop up the executive arm by setting up the powerful new office of state president. This, however, made matters worse, as the republics began to replicate the institution of presidency and elect their own presidents. These developments only served to speed up the breakup of the Soviet ruling elite. The climax came on 12 June 1991 with the election of the president of Russia. The Soviet capital of Moscow, which doubled as the capital of the Russian republic, was now the seat of two presidents, Gorbachev and Yeltsin, each vying for political preeminence. Gorbachev was elected to his post by the votes of several hundred deputies of the USSR Supreme Soviet. His challenger had an unshakable legitimacy of the popular mandate conferred on him by the majority of voters in the core republic.